Backdrop H5(Polyester) is a great choice for present a large scale background display, light in weight and easy to transport. Assembled in 3-5 minutes. Coming with one whole piece of seamless graphic of polyester which is a luxurious (a little silk-like) material , excellent printing details and color. Polyester also can be folded into a small size, very easier to transport. It works both indoors or outdoors environment for years. 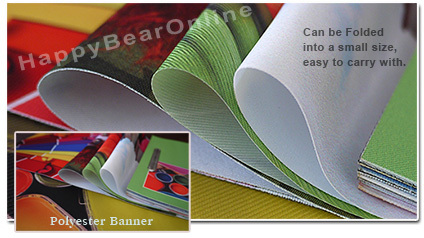 For any question, please contact service@happybearonline.com. * We can be customized any size as required, please contact us. Polyester can be folded into a small size. East to carry with. Packed by sturdy carton tube.